Focusing on hydrological and biogeochemical processes, the EURO-FRIEND 5 project eventually contributes to the currently ongoing paradigm shift in contemporary hydrology, moving from one that is dominated by ‘hydrograph mimicking’ to one based on ‘process understanding’. Since 2006 the project members have presented the results of their research a.o. on joint workshops and conferences organized with ERB (Euro-Mediterranean Network of Experimental Research Basins) network: ERB and EURO-FRIEND 5 conference in Luxembourg (2006), EURO-FRIEND 5 workshop in Brno, Czech Republic (2007), ERB and EURO-FRIEND 5 conference in Cracow, Poland (2008), International Workshop on Status and Perspectives of Hydrology in Small Basins, Goslar-Hahnenklee, Germany (2009). Continuous measurements at the Jalovecky creek catchment outlet (Slovakia) showed that water conductivity responded only to a few big runoff events. Isotopic data collected at several scales (river basin, small catchment and its mountain part) helped to determine mean residence times of water in the catchments of the upper Vah river basin. Evaluation of short data series (2.5 years) using the sine-curve method indicated a negative correlation between mean residence time and catchment area (Holko and Kostka). The combination of environmental isotope and artificial tracer studies in the Lange Bramke Basin (Germany) revealed that fast mass transfer takes place from basin input to groundwater (based on isotopic indications) parallel to the mainly pressure induced rise of the piezometric table. Additionally, by the use of the artificial tracers, it was proven that mass transport in the basins is bound to pronounced subsurface drain lines within the fractured aquifer which adjoin the fractured system to the porous aquifer and subsequently to the flood hydrograph (Herrmann and Schumann). In recent years, the conventional geochemical and isotope tracers have revealed limitations (unstable end member solutions, temporally varying input concentrations, need for unrealistic mixing assumptions). In this context, preliminary investigations in the Attert River basin (Luxembourg) have been focusing on the potential of drift diatoms for providing information on surface streamflow generation processes that are complementary to the insights given by existing isotope and geochemical tracers, e.g. distinguishing between old and new water and determining water flow paths (Pfister). The combination of currently ongoing and future land use and climate changes is likely to have considerable consequences on streamflow generation and biogeochemical processes. This aspect has been investigated within EURO-FRIEND 5 through several case studies. Analyses of before- and after-windfall measurement data from small catchments in the High Tatra Mountains (Slovakia) did not indicate significant impacts due to the deforestation (Holko and Kostka). Hydrological time series analyses, based on 60 years of measurements, revealed that the discharge regime of the Lange Bramke (Germany) has changed towards a more frequent occurrence of long summer (May to October) low water periods (Schumann and Herrmann). 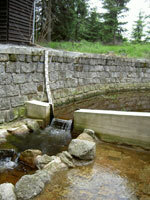 In catchments located in the National Park of the Šumava Mountains (Czech Republic) extremely small diurnal temperature fluctuations in catchments covered with mature forest, in comparison to areas where dead forest causes temperature to rise systematically down to a depth of 15 cm (Tesař). Long term variability of soil water storage in the 20th century has undergone a slight decreasing tendency, which has been significant during the last two decades (Somorowska). Nitrate concentrations in surface and drainage runoff have been evaluated in the agricultural experimental micro-basin Rybarik (Slovakia) from 1987 to 2005. Nitrate concentrations appeared to be highest during spring, with snow melt largely contributing to runoff generation. Moreover, concentrations were significantly higher in the drainage runoff (41 mg.l-1), in comparison to the surface runoff (29 mg.l-1) (Pekarova). In the Hupselse Beek catchment (The Netherlands) water and solute travel times and flow paths at various spatial and temporal scales have been studied. These observations led to the formulation of a spatial averaging approach for each of these flow paths, ultimately enabling to upscale field-scale storage discharge relationships and the prediction of flow path distributions to total catchment discharge (van der Velde).